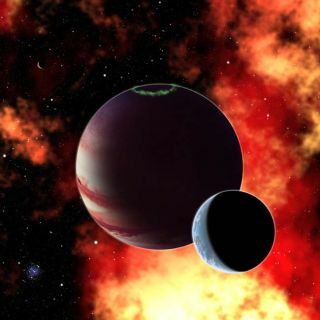 This artist's conception shows a hypothetical gas giant planet with an Earth-like moon similar to the satellite Pandora in the movie "Avatar." If we find such an "exomoon" in the habitable zone of a nearby star, NASA's James Webb Space Telescope, which is slated to launch in 2018, may be able to study its atmosphere and detect key gases like carbon dioxide, oxygen, and water. The new science fiction blockbuster "Avatar" is set on habitable and inhabited moon Pandora, which orbits the fictional gas giant Polyphemus in the real Alpha Centauri system. Although life-bearing moons like Pandora or the Star Wars forest moon of Endor are staples of science fiction, astronomers have yet to discover any moons beyond our solar system. However, they could be science fact, and researchers might soon not only be able to spot them, but also scan their atmospheres for key signs of life as we know it, such as oxygen and water. "If Pandora existed, we potentially could detect it and study its atmosphere in the next decade," said astrophysicist Lisa Kaltenegger of the Harvard-Smithsonian Center for Astrophysics in Cambridge, Mass. Gas giants in our own solar system have many moons, and if the same holds true with alien planets and their moons, "that's a lot of potential habitats," Kaltenegger told SPACE.com. So far, planet searches have detected hundreds of Jupiter-sized objects in a range of orbits around their stars. These giant planets are easier to see because they are huge, but could not serve as homes for life as we know it. However, scientists have speculated whether rocky moons orbiting gas giants could be friendly to life, if that planet orbited within the star's habitable zone – the region warm enough for liquid water to exist on the surface. "All of the gas giant planets in our solar system have rocky and icy moons," Kaltenegger said. "That raises the possibility that alien Jupiters will also have moons. Some of those may be Earth-sized and able to hold onto an atmosphere." NASA's Kepler mission, launched in March, could find alien moons, or exomoons. Currently it looks for alien planets, or exoplanets, which cross in front of their host stars, eclipsing the star's light by a small but detectable amount. Such a "transit" lasts only hours and requires exact alignment of star and planet along our line of sight. "Before, we had not found a way to detect and separate the light from the exoplanet and its moons, since they're so close together and the signal we'd get off a planet would be roughly 100 times greater than its moon because of its surface area," Kaltenegger said. "But now we've figured out that if everything is right, we have a way to tell them apart." An exomoon's gravity would tug on its planet and either speed or slow its transit, depending on whether the moon leads or trails the planet, she explained. The resulting variations in each transit's length of time would indicate an exomoon's existence. Alternatively, when an exomoon passes between the star and us, it would make it look slightly dimmer, a change scientists might also be able to detect. Once a moon is found, the next obvious question would be whether it had an atmosphere. If it does, those gases will absorb a fraction of the star's light during the transit, leaving a tiny, telltale fingerprint to the atmosphere's composition. An Earth-sized moon could be studied if conditions are just right. For example, the separation of moon and planet needs to be large enough that we could catch just the moon in transit, while its planet is off to one side of the star. In a paper submitted to Astrophysical Journal Letters, Kaltenegger calculated what conditions are best for analyzing the atmospheres of alien moons. She found that Alpha Centauri A, the star featured in "Avatar," would be an example of an excellent target that researchers could scan with the next-generation James Webb Space Telescope in the near future. "Alpha Centauri A is a bright, nearby star very similar to our Sun, so it gives us a strong signal," Kaltenegger explained. "You would only need a handful of transits to find water, oxygen, carbon dioxide, and methane on an Earth-like moon such as Pandora." Unfortunately, Alpha Centauri A does not seem to possess a giant planet. Still, "a lot of close stars have extrasolar giant planets," Kaltenegger said, "and some of them orbit in the habitable zones of their stars, making them potential 'Pandora' systems." Although Alpha Centauri A offers tantalizing possibilities, small, dim, red dwarf stars might be better targets when looking for life-bearing planets or moons. The habitable zone for a red dwarf is closer to the star, which increases the chances of spotting an exoplanet's transit. One dilemma a planet in a red dwarf's habitable zone might face is that it would also be close enough for the star's gravity to slow it until one side always faces the red dwarf – the same process that keeps one side of the Moon always facing Earth. One side of this "tidally locked" planet then would be baked in constant sunlight while the other side would be trapped in constant darkness, potentially with strong winds constantly driven from the hot to cold side. An exomoon in a red dwarf's habitable zone wouldn't face this problem. The moon would be tidally locked to its planet, not to the star, and therefore would have regular day-night cycles just like Earth. Its atmosphere would moderate temperatures, and plant life would have a source of energy moon-wide. "Alien moons orbiting gas giant planets may be more likely to be habitable than tidally locked Earth-sized planets or super-Earths," Kaltenegger said. "We should certainly keep them in mind as we work toward the ultimate goal of finding alien life." If there is life on alien moons, it might have to deal with a host of challenges beyond the flying dragon-like creatures "Avatar" depicts. Jupiter's moons exist within an intense radiation belt of electrons and ions trapped in the planet's magnetic field, and Saturn's gravitational pull leads to extraordinary tidal effects that may have once ripped apart nascent moons to produce its rings. Even today, Saturn's tidal effect on its moon Titan – some 400 times greater than our moon's effect on Earth – can drive winds and volcanic eruptions. When analyzing if a rocky exomoon can support life as we know it, Kaltenegger explained the first step is seeing whether it is big enough to hold onto an atmosphere. While our moon is too small, Saturn's moon Titan is massive enough to keep an atmosphere. Heat is an issue when it comes to holding onto a sky, however – "if you were to heat up Titan to Earth's temperatures, it would lose part of its atmosphere," Kaltenegger explained. "So massive is good." She noted that past studies calculated at least one-tenth of Earth's mass was desirable. The next step is finding out if the exomoon has a magnetosphere to protect it from streams of particles from its star and radiation from its planet, which could strip the moon's atmosphere off. "Ganymede is the largest moon in our solar system, and it has a magnetosphere," Kaltenegger noted. Tides on such moons would be very strong – "probably a surfer's paradise," Kaltenegger said. "From watching Jupiter's moon Io, we'd expect a big potential for tidally induced volcanism, especially if there is more than one exomoon." The skies of these moons could be dramatic. "I'd speculate that there'd be spectacular aurorae from the interactions between an exomoon's magnetic field and its star or planet," Kaltenegger said. "What color of course will depend on what the atmosphere is made of, but it might lead to amazing light shows in the moon's sky." Many of the exoplanets discovered so far are more massive than Jupiter, the most massive planet in our solar system. "The fun thing is that if you make a planet bigger, the moons should be bigger too, roughly, which means those can start to hold onto atmospheres more," Kaltenegger said. "So you could have situations where you could have a gas giant with four moons that are all habitable. That depends, again, on if they have magnetospheres and can hold onto atmospheres, but all of a sudden, you've opened up the opportunity for habitats that can be completely new, fascinatingly different and potentially very weird."